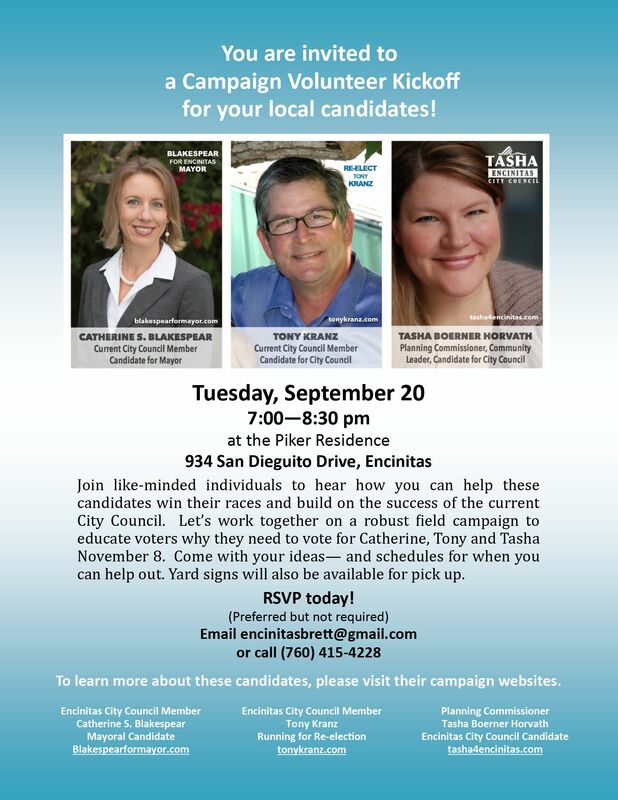 With our first public candidate forum, regular Encinitas City Council meetings and a campaign schedule packed with meet & greets, we’re clearly in that hectic final sprint toward the election! The removal of four large, beautiful ficus trees in downtown Encinitas has been put on hold until we evaluate whether the trees qualify as “Heritage Trees.” The city is considering removal of the trees because of complaints and litigation threats from nearby property owners. The trees pose a safety risk from falling limbs, the roots push up the sidewalks, get into the sewer systems and crack foundations. I love the ficus tree canopy downtown. It creates atmosphere, cools the air and represents the direction I’d like to see us go as a city. When members of the public requested that the trees be designated Heritage Trees because they are a “defining landmark or significant outstanding feature of a neighborhood,” I expressed support. The city needs to do more to protect and improve our tree canopy. If this requires that we put more money into stopping tree roots from invading neighboring properties by building barriers, aggressively trimming trees to reduce their size and root spread, and consciously planting trees that produce shade, I support that. 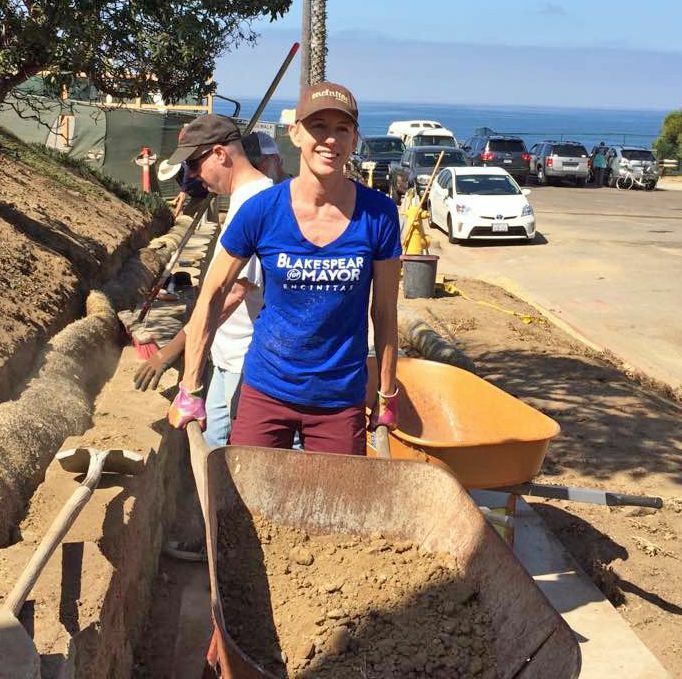 I spent Saturday morning helping other volunteers clean up and prepare the Pacific View site for its transformation into the Pacific View Academy of Arts. It promises to be an exciting new public place that Encinitas can be proud of. For more information, visit the Encinitas Arts, Culture and Ecology Alliance website. A new pedestrian railroad crossing? A crossing at Montgomery is being considered to create an additional legal and safe railroad crossing in the 1.5 mile stretch between Chesterfield and Santa Fe Drive. Directly across from Cardiff School, this spot is roughly halfway between those two existing crossings; it’s relatively flat and wide, having been a car crossing in the 1960s, and it’s currently the most heavily used crossing spot for those headed to the beach. As part of installing a legal crossing, the railroad authorities require that the city put in a wayside horn, which is a type of horn that blows next to the crossing and is directed down at those near the tracks. The train engineer then doesn’t need to blow the train horn, which is directed out toward everyone in the larger vicinity. This wayside horn test is providing the city and residents with more crucial information that will help us make the best choices. It’s simply another data point for planning in the rail corridor. The ultimate goal is to have a corridor-long quiet zone, which means no train horns and no wayside horns unless the train engineer sees a hazard on the tracks. However, given the regulatory complexities and costs of this, it appears that the city will have to put in the interim measure of the wayside horn before we’d be able to get regulatory approval for an entire corridor quiet zone. Planning in the rail corridor is complex, and there’s no single right answer. The ultimate decisions depend on what we as a community value. We can’t weigh our options before we have all the information about tradeoffs, costs and benefits. I’d like to see us use our rail corridor better – silence the train horns, make it easier and safer to cross the tracks, and create a friendlier path for pedestrians and cyclists. Any solution I’ll work toward will need to maintain the natural feel, protect sensitive bluffs and plant life, and have a small footprint. As a city, doing nothing is always an option. But other agencies will continue with their plans — the double-tracking through Cardiff and Leucadia will happen, and the San Elijo bridge will be rebuilt. This will result in substantially more train traffic. The construction of a culvert will make the unpermitted crossings around Montgomery and other places more difficult. The periodic ticketing sweeps by the North County Transit District that are taking place right now will continue. Is this the option that we as residents prefer? Or would we like to see proactive action on the city’s part to create something we can be proud of and that will improve quality of life and beach access here in our beautiful city? I recently attended the second meeting of the stakeholder working group and believe this is the right approach to making ultimate decisions about the rail corridor and related issues, such as parking and mobility in general. With this working group, we’re transparently sharing decision-making, instead of retreating behind closed doors or giving undue weight to one group or another. I hope and expect that the depth of information presented and the competing interests at stake will be more fully vetted in future meetings. These possibilities include trenching the tracks, crossings at locations other than Montgomery in Cardiff as well as various locations in Leucadia, and the possible designs and costs of tunnels or bridges, as well as at-grade crossings. For more information, a flier about the wayside horn demonstration is here. You can provide feedback on the wayside horn demonstration to Public Works Deputy Director Ed Deane at 760-633-2872 or email cmls@encinitasca.gov. This is an excellent opportunity to weigh in on a significant local issue. 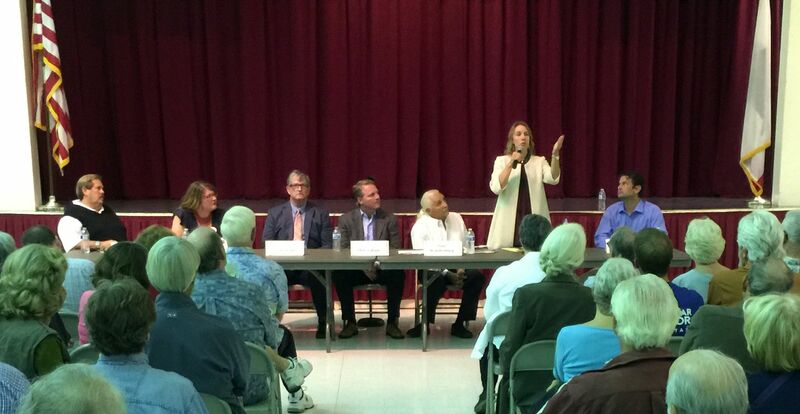 Managing the city’s long-term fiscal health is a top priority of mine. At this week’s City Council meeting, I introduced a Council Member-Initiated Item (here) for the city staff to provide us with options about assessing and responsibly managing future pension and other post-employment obligations such as retiree healthcare. The city is financially well-managed, and we already prepay some pension debt, but we don’t have clear information about our ultimate liability. This may require having an actuary to do a customized city study because CalPERS (our retirement system) doesn’t provide us with this information. I was grateful that the Council unanimously supported this item, which we’ll consider at budget time. P.S. It’s a great time to display your free Blakespear for Mayor yard sign, and we’ll gladly deliver it to your home or business! 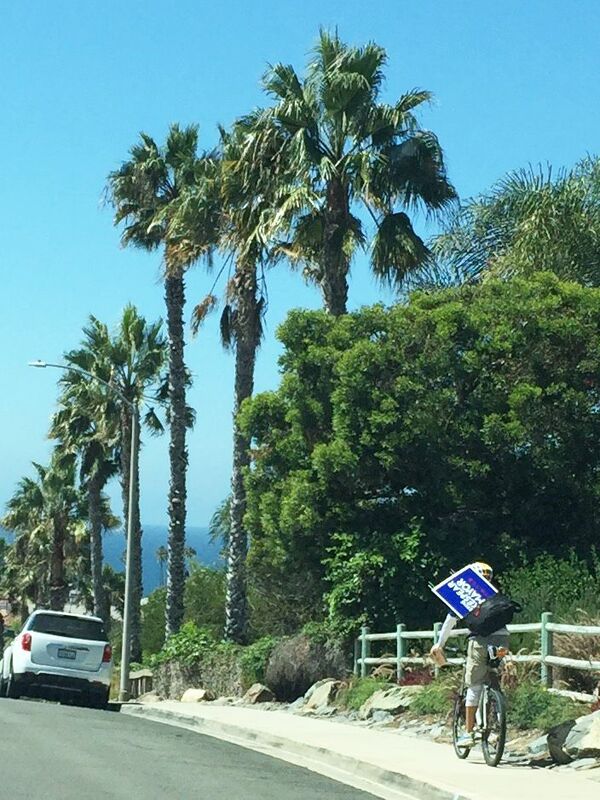 Yard signs are one of the most effective ways to get the word out, because you’re telling your neighbors your choice for Mayor of Encinitas. If you requested one and haven’t received it yet, please request it again by clicking here. I’m grateful for the support of Jeremy Kron, a former bicycle messenger who delivers our signs around the city nearly every day. What a great reflection of our campaign ethic! If you would like to be involved in the volunteer aspects of this campaign, plus the campaigns of Tony Kranz or Tasha Boerner Horvath, please attend a volunteer meeting this Tuesday, September 20 at 7 p.m. at the home of Kim Piker. Please click here for more details or send an email to encinitasbrett@gmail.com. And to join us at any of our local meet-and-greets, please click here. It’ll be great to see you! Previous Post9/11/16: Can Catherine Count on You?Next Post9/24/16: Mayoral Momentum!